The valley is filled with a thin layer of ground fog. The sun illuminated light sculptures on the left and the right are fog banks at around 1000 m above sea level. 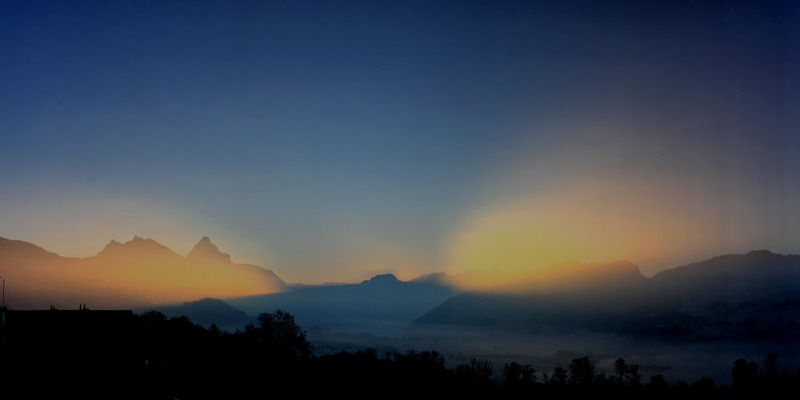 That special scene is created by the sun hiding behind the ‘Wasserberg’ mountain in the middle of the picture: the mountains created two narrow light beams to the left and right illuminating the fog banks, creating that interesting scene. I was lucky to be at the right time at the right spot :-). This entry was posted in Pictures, Switzerland and tagged Mountains, Photography, Picture, Sunrise, Swiss Alps, Switzerland by Erich Styger. Bookmark the permalink.